'Blasphemous' claims, rumours of miracles and a growing band of supporters, amid increasing hostility and a brutal murder plot. John records these tumultuous events in his Gospel, while focusing on his main theme: the identity of the man central to this controversy, Jesus. David Cook takes us through this Gospel in thirty undated devotions. Discover the identity of the Man who turns water into wine, heals the sick and claims that He alone is the way, the truth and the life. Each devotion includes a detailed exploration of the passage and helpful questions to aid reflection. So open up John's Gospel using these notes as your guide and, as John intended for his first readers, be encouraged that Jesus truly is the Christ, the Son of God. 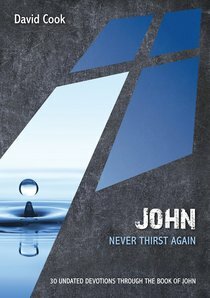 About "John - Never Thirst Again (10 Publishing Devotions Series)"